These graphic organizers are like mini doodle notes for review! Each card in the deck of 100 templates is a manageable study guide. Students can select a half-page graphic layout that fits the content and create their own visual review guide. They'll keep & collect them as a reference. Visual note taking takes advantage of biological brain processing to increase student focus and boost retention! The graphic layout of these study guides allows students to mentally organize the information in their minds, understand the relationships and connections between ideas, and remember the lesson material better! Get bonus brain benefits by having students add color and images to transform these into memory-friendly sketch / doodle notes! This deck can be used in any content / subject area, and for a wide range of grade levels. 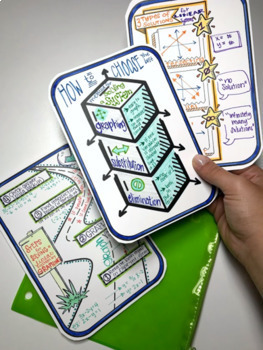 By creating these visual concept maps, students will develop their own study guides and build note taking and study skills. They are small enough to keep in a half-sized expanding file, or fit right into notebooks as interactive notebook templates. The details are included in the preview file! 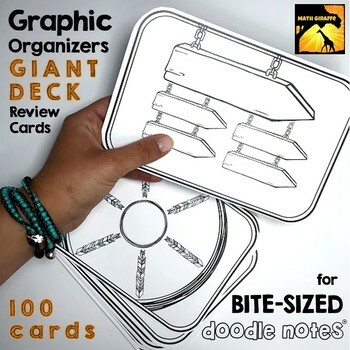 Check it out to see all the ways to use this card deck and view all 100 graphic organizers! 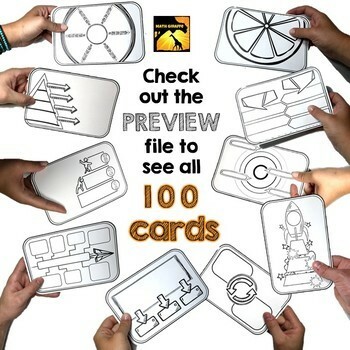 You may also like this similar pack of visual vocabulary doodle card templates.